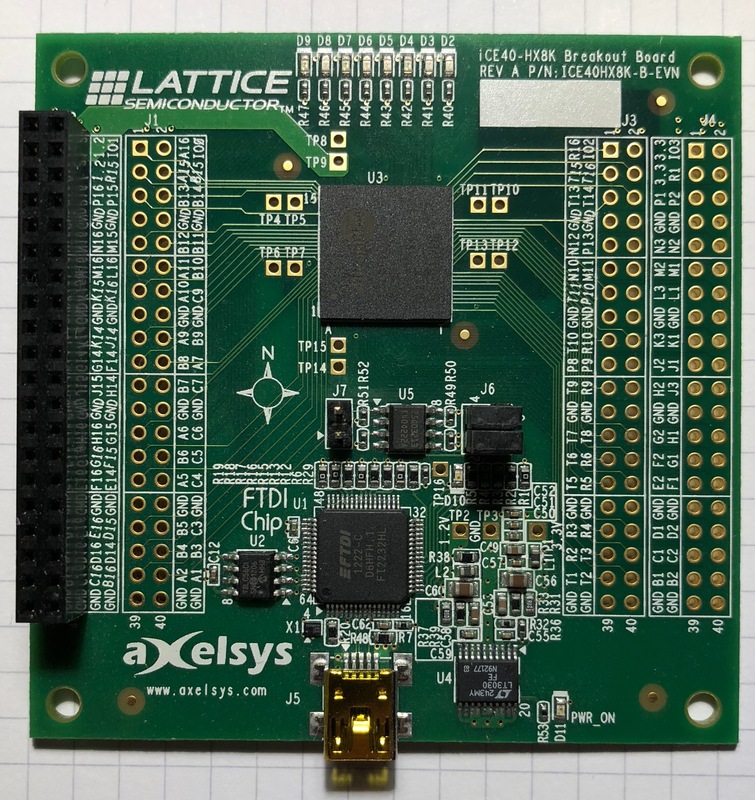 Lattice make a breakout board2 for their iCE40HX-8K FPGA. It is a significantly bigger array than the HX1K chip on the iCEstick3. For full documentation on the board, see the user guide4. Now let’s tackle the hardware. By default, the programmer on the board programs the external flash chip. However, it is more convenient and faster to use the SRAM inside the FPGA. Moreover, the programming configuration below assumes that you’re programming the SRAM. For more details, see pages 5 and 6 of the user guide6. 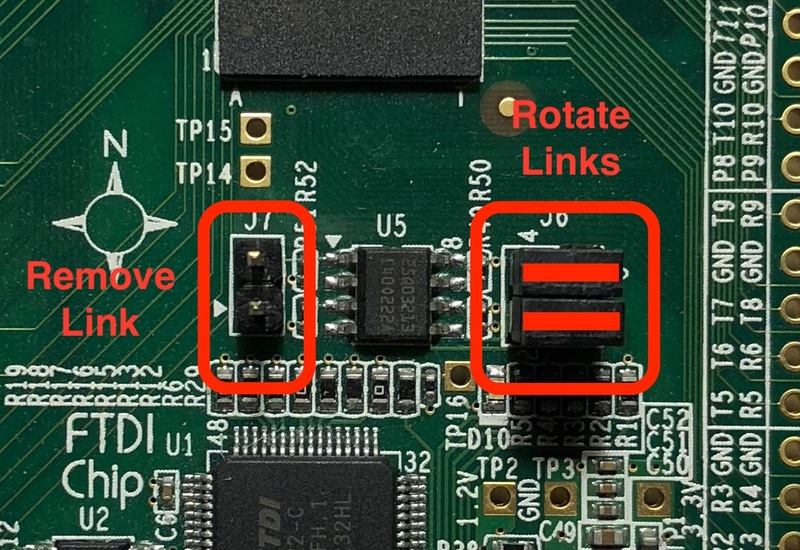 Having moved the links, connect the board to a USB port. If you have a frequency counter to hand, measure the frequency on test point A: it should be exactly 6MHz. If you prefer something slower, you should find a frequency of exactly 1Hz, with a duty cycle of 1/16 on test point B. Full schematics of the board are available in the user manual8. Here are some highlights, relevant to our simple project. The FPGA is a iCE40HX-8K in a 256-pin LFBGA. A 12MHz clock from a ceramic resonator is provided on pin J3. As you can see the PLL can generate this clock exactly. Notice too, that icepll helpfully writes the relevant verilog to a file. Sadly though, the verilog doesn’t use global clock buffers, so it needs to be tweaked by hand. The port sports eight red LEDs arranged in a line. They are attached to pins B5, B4, A2, A1, C5, C4, B3, and C3. 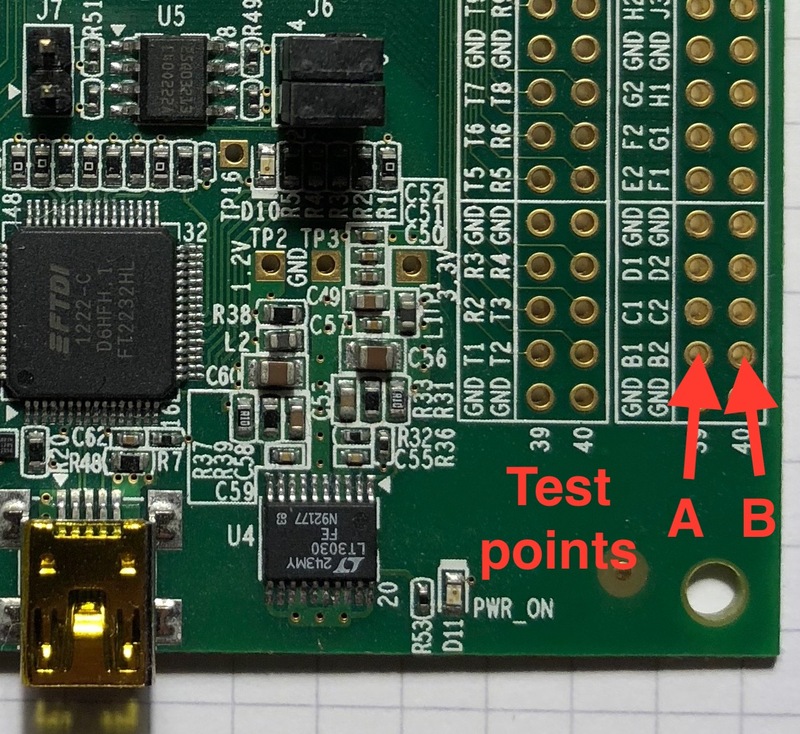 As befits the name breakout board, many spare IO pins exist, and we use two as test points: B1 and B2. The board has a FTDI 2232H USB interface which can be used to program both external flash and internal SRAM with iceprog from the IceStorm Tools. You must supply the -S flag to iceprog when programming the SRAM. Note: jumpers J6 and J7 on the board govern whether the flash or SRAM is programmed. As shipped they are set for flash, but the walkthrough above moves them to SRAM mode. Please remember that you can download all of this from GitHub9. The code is much as you’d expect, though it takes slightly more care than its counterpart for the iCEstick10. In particular, we use the PLL’s locked signal to reset things on power-up. Rather than a free-running binary counter, we also generate a precise 16Hz clock so that the 16-cycle animation should take exactly one second (modulo the accuracy of the master oscillator). * Generate test signals at 6.0MHz and 1Hz. // a register holding LED state. The PLL code is generated by icepll, then edited to use global buffers to distribute the clock and locked status. Technical note TN125111 discusses clocks and PLLs on the iCE40. Note the the programming command now sports a -S flag: this means program the SRAM, not the external flash chip. Revised by Martin Oldfield on 02 Mar 2018, original version 27 Feb 2018.